Why Crystals Work in Crystal Healing. Why Crystals work for healing is a question that I am often asked. As a qualified Crystal and Reiki Master Healer the simple answers is that no-one is absolutely sure! However there is of course a more complex answer. I believe that crystals may be healing on several levels at once - body, mind and spirit - and we have some idea both scientifically and esoterically how this can be. What does a Healing Crystal actually do? To answer your question as to why crystals work (research) I have to first give you some background on what healing crystals actually do. Crystals are energy transmitters - their crystalline structure indicate that they can absorb, focus and then transmit subtle electromagnetic energy, which we see when they use quartz crystal in radios and watches, this is the same quality that is used in crystal healing. Everything is constructed from the atom and each atom is a nucleus with electrons rotating around it that is in perpetual motion. Knowing this you can therefore say that all living as well as "non-living" things vibrate to certain frequencies. As humans we are an incredibly complex mix of vibrations which get disturbed easily , going out of balance and causing illness or dis-ease. Everything from external influences such as electromagnetic and geopathic stress, to internal ones such as constant negative thought patterns and the suppression of your emotions can and does affect your unique vibration. Crystals, on the other hand, due to their regulatory lattice structure, have a pure energy that vibrate at a fixed, stable and unchangeable frequency. How do Crystals Work for You? When you are out of balance and the crystals' vibrations (vibrating at a fixed, stable and unchangeable frequency) come into contact with your own vibration, the pure vibrations of the healing crystal will interact with and change your vibration, bringing that imbalance closer to harmony. ... I am sure you've felt the beat (vibration) of a bass drum? The way I like to look at it is that when doing crystal healing, you are "dancing with the healing crystals", a symbiotic relationship so to speak. By placing healing stones close to an energy imbalance whether physical illness, emotional or mental upsets, they will encourage rhythm, flow, harmony and health, thereby allowing your healing process to be quicker and more effective which you can learn to do for yourself. 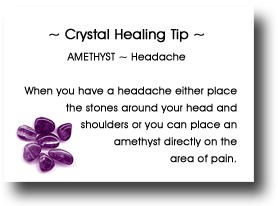 However as with any healing, but much more so with crystal healing, at this cellular level the person receiving the healing, you, has to actively take part by allowing, accepting and being open to the healing crystals' vibration. Through my own studies and investigations I have come to an understanding as to why these special stones aid in the healing process through crystal healing. Current research is now showing that many other parts of the body and its systems have similar crystalline patterns. It has been found that there is a recognition and resonance between the earths healing crystals and the "bio" crystals of the human body, including such as cell salts, lymphatics, fatty tissue, red and white blood cells & the pineal gland, giving rise to the crystals' healing power and potential. Because of this similarity the human body is particularly receptive to the perfect energy fields of crystals which when put together in close proximity will bring the humans energy patterns back into perfect balance and harmony. Now that you have a better understanding of why crystals work for healing you will want to experience the benefits of crystal healing for yourself. My Crystal Healing Course "Know & Heal Yourself" is a great place to start as it will teach you the basics and foundation of healing with crystals, how to choose and care for your healing stones, which stone to use for yourself as well as some terrific and effective crystal self-healing techniques.